Consider Life on Wheels as a fairy tale…in the early 1900's people fell in love with the automobile. It felt like destiny and the culmination of all of our mobility dreams - horses, boats, and trains were all leading up to a Happy Ever After with the car. We were free, we were in love. However, despite our rosy beginnings, the car came with a dark curse that threatens to destroy the entire planet. Not only is it killing us in numbers that exceed all global warfare over the past 100 years, it is taking our time, money, health, and even the future of our planet by creating widespread environmental damage. Luckily for the planet, and for humanity, many smart, plucky, creative people around the world are working to lift the curse. LOW follows these heroes and looks to the future, when people everywhere will be free of the tyranny of the car. Villagers (all of us) around the world are creating new ways of getting from here to there that result in fresh air, healthy communities, and safe streets. Wise leaders are listening and supporting the quest. Ultimately, even the auto itself can be redeemed as it begins to work with other forms of transportation in service of human beings and the planet. Our film brings together disparate voices in a fresh, coherent conversation. Telling the story through the eyes of real families and households, we paint pictures of potential futures based in new social movements and lifestyle trends, game-changing technologies, and new business models. We depict an entire industry and infrastructure on the edge of disruption; just as in the computer industry during the 80s, new technologies are coming on line faster than people can figure out how to apply them. No one knows the rules yet and so people - businesses, citizens, and policy makers - are making it up as they go along. 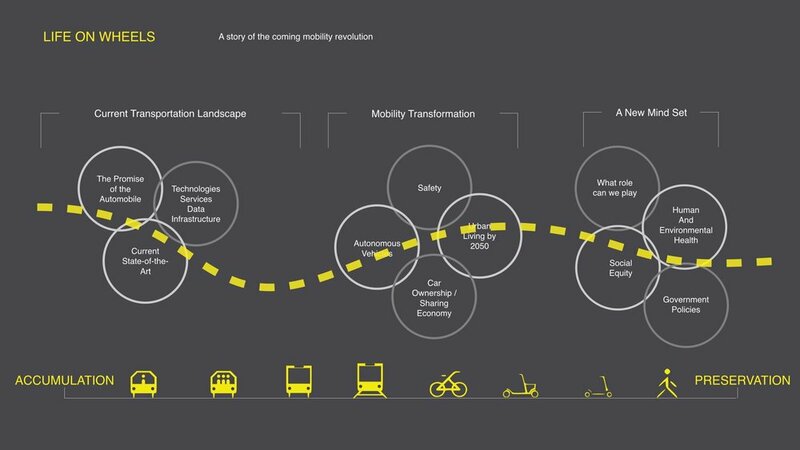 At the same time, as we track this “wild west” of mobility, we dismantle the viability and the glory myths of the current, outmoded systems, giving urgency to the transformation. Peter Calthorpe Architect, urban designer and urban planner. Sharon Feigon Founder - iGo, non-profit carshare Now part of Enterprise Car Rental. Richard Sears Consulting Professor, Department of Energy Resources Engineering Stanford.